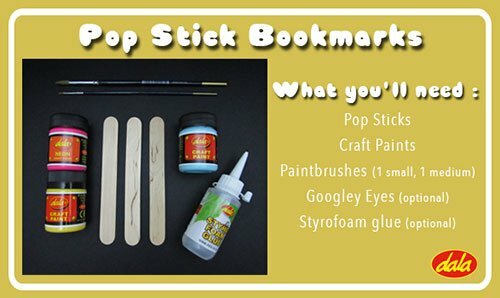 Coat your pop sticks on both sides with your medium brush, making sure the coat is even. You may apply a second coat if the colour isn't bold enough. 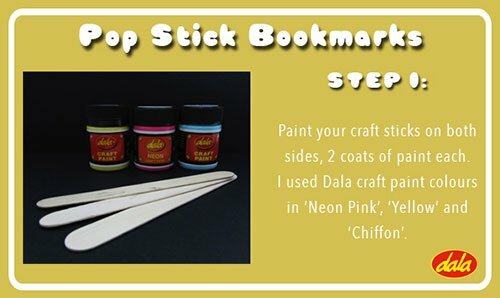 I've chosen to use craft paints in these Dala shades: 'Neon Pink', 'Yellow' and 'Chiffon', plus White and Black for details. Let these dry for a few minutes. 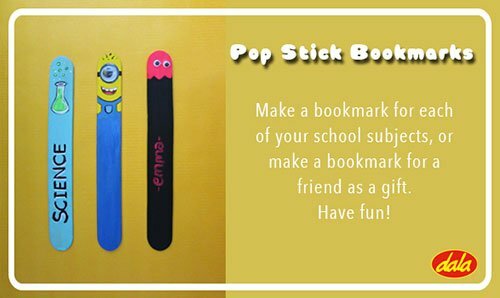 Decide on how you would like to decorate your pop sticks. Let the colours you have chosen inspire you. 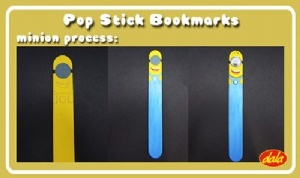 With my yellow coated pop stick I decided to create a 'minion' from "Despicable Me". I also wanted to stick on a googley eye instead of painting it on for a nice effect, but painting will work just as well. 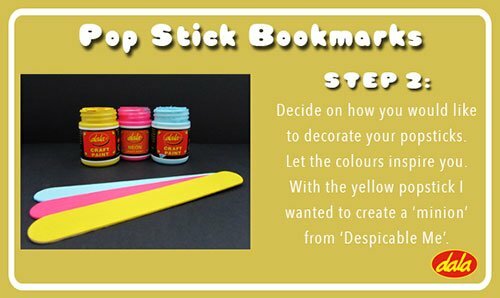 Feel free to stick on embellishments that you may have at home, like buttons and sequins making sure that they won't interfere with the pop sticks function as a bookmark. 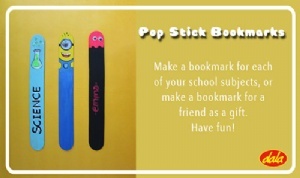 See the below image and suggestion if you would like to create a minion pop stick as well. Draw a circle in the centre of the pop stick, at the top end. This will be your minions eye. Fill in the goggle straps on either side of the eye in grey. A little below, that draw an open smiling mouth for him with his top row of rounded teeth exposed. Leave a gap for his neck and begin to draw his dungarees as I have in the image 1 on the left. Now it is time to give some colour to the shapes you have created / drawn using the small brush. Use a darker blue for the dungarees, and a lighter blue for his pocket (Image 2). 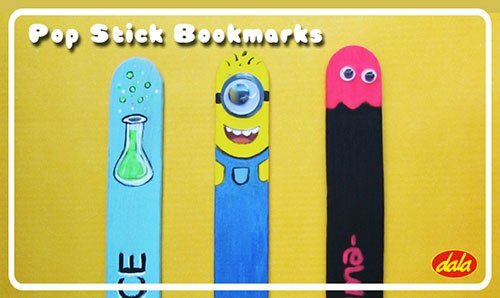 Once all of your minions colour has been filled in, outline certain features with your small brush in black to make them stand out. Add all the finer details last, like his hair and add reflections with your small brush in white on his goggles. Create a bookmark for each school subject and theme it accordingly eg for science I painted a little chemical bottle. 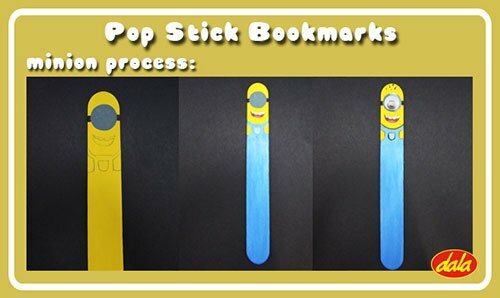 You can even make a few extra bookmarks as gifts for friends/ family and personalise them with your friends favourite cartoon character, game characters, animals etc. This item has 734 views.